Pesto is one of the most all-purpose sauces in the kitchen. It can be used as a topping for pasta, a dressing for pasta salad, a marinade for grilled chicken and even a sandwich spread. And basil isn’t the only herb that can be used—it can be made with sage, arugula, and a wide variety of other green herbs and vegetables. 1. 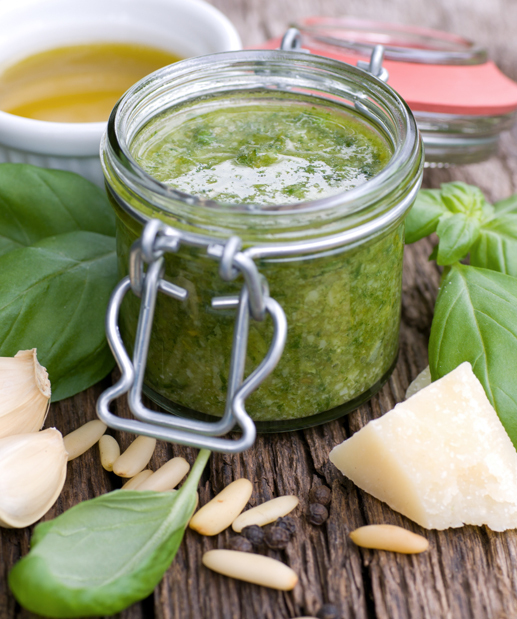 Put basil, pine nuts, and garlic in the bowl of a food processor and pulse until fairly smooth. 2. Pour the rest of the olive oil into running food processor in a steady stream until the mixture is thick but liquid. 3. Add grated Parmesan and continue to process. Adjust to desired consistency with the remaining oil. Check seasoning and adjust if necessary. Use immediately or cover with a thin layer of olive oil and store in the refrigerator. *Percent Daily Values are based on a 2,000 calorie diet. Your daily values may be higher or lower depending upon your caloric intake.